We eat a variety of healthy grains in our home, but one of our favorites is an ancient grain I discovered while we were living in Umbria called farro. I use farro in my soups, in place of rice in risotto, or in a variety of salads such as this one made with fennel, celery, and edamame. If I were in Umbria, I would use fresh fava beans in this salad, but unfortunately fava beans are very difficult to find here in Florida, so I substituted edamame instead. If you prefer, spring peas would also be a great substitution. When I think of spring salads, I think of bright green vegetables, so I kept the color palette bright and fresh using only green vegetables. I used a light lemon based dressing in my salad which works really well with the nutty flavored farro. Farro should be cooked just until it is tender to the bite, but it should still be fairly firm. Nothing worse than overcooked mushy farro in a salad! To cook your farro, simply bring a pot of salted water to a boil, then drop in your farro and cook until tender, or “al dente”. 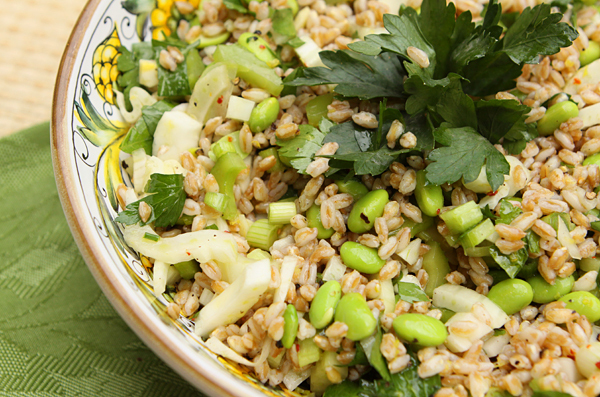 I often used pearled farro which cooks quicker than regular farro, taking just about 15 to 20 minutes to cook. 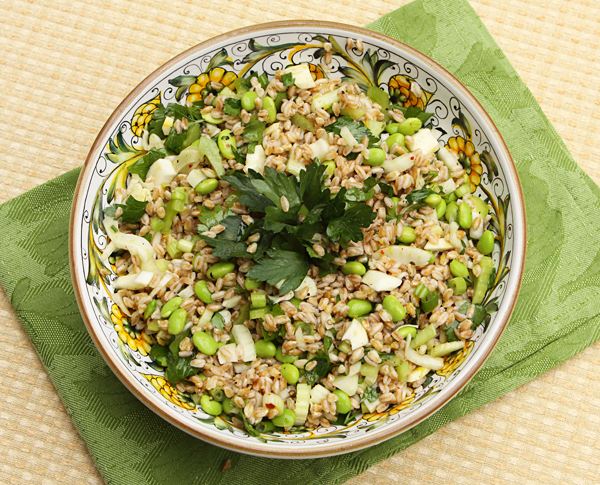 If you cannot find farro, you could substitute pearl barley in its place. Edamame are a natural source of antioxidants and isoflavones, are low in fat and high in protein. In addition to its unusual phytonutrients, fennel bulb is an excellent source of vitamin C.
A crunchy, high fiber salad that is vibrant in color and flavor. Mix the salad ingredients together in a large bowl. In a small bowl, whisk together the lemon juice, olive oil, salt & pepper. Toss the salad ingredients with the dressing, taste and adjust as needed. Let the salad sit for 30 minutes, toss once more, then serve.